3P production-preparation processes such as the press-automation project undertaken at The HON Co. plant in Cedartown, GA, focus on eliminating waste through product and process design. Lean consultants suggest that the best to tackle such projects is to involve a diverse group of people in a series of brainstorming sessions to identify and discuss alternative s to meet a specific goal, such as improving ergonomics or increasing throughput. The team should comprise designers, engineers from multiple disciplines, operators and operations managers. Typically, these projects, which start with a clean sheet of paper, result in bigger paybacks than do the incremental improvements resulting from kaizen events. The focus is on project management and waste reduction, or elimination. Once the 3P team has selected its preferred solution to the task at hand, it then works to demonstrate the flow of raw material to finished product, using diagrams and sketches. Then, as did the press-automation team at HON, it constructs a prototype to simulate the process to verify that it will operate as designed and produce the expected results. Finally, the team develops an implementation plan, complete with resource requirements and assignment of responsibilities. Each robot in the HON Co. pressroom tends two presses, one tooled for stamping legal-size drawer parts, the other for letter-size parts. 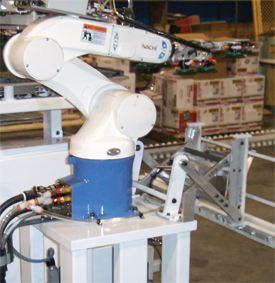 Robots mount on a manually adjustable riser assembly that rides a floor-mounted track to access the two presses, with a hard stop and locking mechanism to secure the robot at each press. for its parent, HNI Corp., touted as the second-largest manufacturer of office furniture in the world; HON makes panel systems, desks, storage files and tables. HNI has earned recognition as one of the 50 best manufacturing companies (IndustryWeek magazine), and it was named one of America’s Most Admired Companies in the furniture industry in 2008 by Fortune magazine. IndustryWeek named the HON plant in Cedartown one of the 10 best manufacturing facilities in North America in 2005; the plant won a Shingo Prize for Excellence in Manufacturing in 2007; and it earned Georgia Manufacturer of the Year in 2006 from the Georgia Department of Technical and Adult Education and the Georgia Department of Economic Development. And that’s just the beginning—other awards have come for the firm’s expertise and performance in design, pollution control and organizational excellence. RCI drives all of the innovative ideas that pour out of The HON Co.’s 600 employees, as they strive to improve safety and quality, reduce costs and improve productivity. The HON steel-fabrication department supplies four assembly lines in the plant, two of which manufacture vertical filing cabinets, one which makes metal desks, and a fourth line that assembles lateral files and storage cases, shelf files and bookcases. Early in 2000, an RCI project had a HON work team focused on improving the safety and productivity of its stamping-press operations within the steel-fabrication department. There, presses hem 0.022-in.-thick mild-steel blanks for drawer fronts, in two sizes to accommodate letter- or legal-size files. Hand feeding of blanks into two-station transfer dies at a production rate of 400/hr. taxed the firm’s press operators, who used gripper wands to move the blanks rather than reach into the dies. The process proved safer than hand feeding to be sure, but manipulating blank after blank on the end of the wands led to ergonomics issues—carpal tunnel syndrome to be exact. A 3P (production preparation process) project proved out the robotic press-tending cell arrangement and HON brought in local robot integrator Tec Automation, Inc., Canton, GA, to manage the project. The first press robot went online late in 2000, a second in 2001, the third in 2003, and the plant will fire up its fourth press-tending robot before the end of 2009. Each robot tends two presses, one tooled for stamping legal-size drawer parts, the other for letter-size parts. Robots rides a track to access the two presses, with a hard stop and locking mechanism to secure the robot at the press. Presses are 100- and 150-ton models with 8-in. stroke to accommodate the robot end-of-arm tooling. Robots are ABB (one) and Nachi (three) six-axis pedestal-mounted units. “TEC designed the tool and included vacuum sensors to verify part presence,” says Coffman. Each die comprises two stations—bend and crimp —so the tool carries two grippers, one to load a fresh blank in station one and the second to move blanks from station one to station two and to deposit finished parts onto a conveyor. All in 6 sec. “We designed the cells to keep the end-of-arm tooling as simple as possible,” says TEC vice president Jim Webb, “and worked closely with the tooling vendor to add automation-friendly features to the dies to achieve throughput and quality specifications. After the robot drops the blanks in the die station, actuators built into the die fine-tune blank location to ensure dimensional repeatability. We also provided a registration fixture for the pick-and-place blank destacker. After the destacker stages a blank for the robot, the fixture crowds the blank into a corner to register the datum point and locate the edges, to ensure the robot grabs the part exactly where it’s supposed to. To make its presses automation-friendly, HON added new controls and redundant PLCs, one dedicated to communicating with the robot and one to operate the press. It also added an HMI panel near the robot control panel to allow cell setup from one location. In addition to the improvement in operator safety and ergonomics upgrade, Coffman also notes an improvement in part quality since the move to robotics. See also: ABB Robotics, Tec Automation, Inc., Nachi America, Inc.